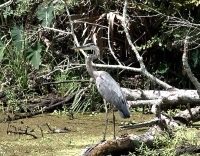 Jean Lafitte National Historical Park and Preserve is a great place to experience bayou life in Louisiana. The park, named after the notorious early-19th century pirate, consists of six physically separate sites and a park headquarters. These include the Acadian Cultural Center in Lafayette, the Prairie Acadian Cultural Center in Eunice, the Wetlands Acadian Cultural Center in Thibodaux, the Barataria Preserve in Marrero, the Chalmette Battlefield and National Cemetery in Chalmetter, and the French Quarter Visitor Center in New Orleans. The park offers a variety of activities, including bayou cruises from the Acadian Cultural Center, birdwatching and swamp walks in Barataria Preserve, and paddlewheel boat trips from New Orleans to the historic Chalmette Battlefield sites.